Games Meet Metal: Hello, empty checking account. I missed you! Oh, damn you Microsoft and Bungie! How dare you dangle stuff like this over my nose while I'm actively trying to SAVE money? Recession, hellooooo! Aw, you don't care though. You know I'm gonna buy it. 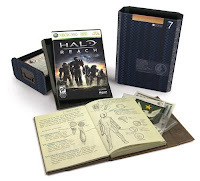 Speaking of "it", what you're looking at to the left there is the Legendary edition of Halo Reach, and this sucker's priced at $149.99. So, what do you get in the package? Besides the inability to pay the electric bill? 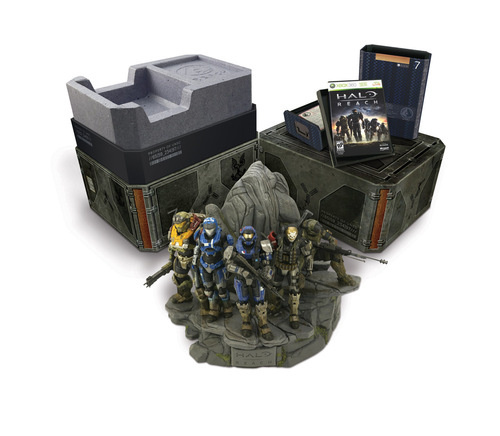 Well, for starters you get that sweet looking Spartan troup mural thingie, designed by Mcfarlane Toys. Plus, you get the Limited version of the game itself, which you can pick up for $79.99 by itself. Inside the game case is all the usual bells and whistles. A making-of doc, a bunch of exclusive swag goodies, and some keen DLC armor upgrades. Then all of this gets packages in a look-a-like USC cargo container. The whole package sounds like it's busting near twenty pounds at this point. The set will be out on September, er, something-or-other. Microsoft still hasn't bashed out a release date yet, but September's looking to be the month. 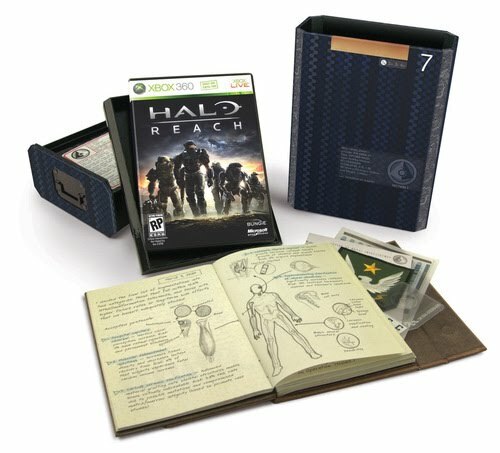 Also, don't forget to get in on the free beta for Reach starting on May 3rd. Cool. Didn't know this existed. I probably won't be dropping my cash on this like the cat helmet though.